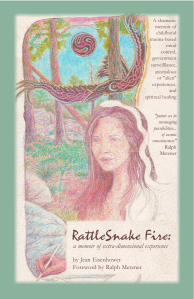 For more blurbs and information, visit http://rattlesnakefire.com. Just finished your book for the first time, I will definitely be rereading and recommending it as life goes on, and wanted to leave a quick message just to affirm and validate you, as surfers go, I hope you ride some big waves with all those board skills you picked up! We are in the strange position described by science (my version) as a hologram talking to itself using virtual photons to transmit information through a hyper tunneling nucleus model, as opposed to the electron mesh physics we are supposed to spend the rest of our lives on the wrong side of the fence from interior changes we can access through the faster than light tunneling that leaves us nourishing the ghosts of our ancient bones. Anyway, the more someone’s story makes sense, the more powerful the role of the imagination gets, and the less logical ultrasimplified models appear to be, because no need to connect the dots when the dots are talking without using lines between them, right? I have survived a lot of storms by slamming the door on the less polished awarenesses in my immediated environment, a book like yours keeps my belief in high standards staying worthy no matter how long the fall in the abyss or trek through the wasteland proves to be! Hope to reach out sometime to you again, too. Well, Dan, your first paragraph I think I sorta get the gist of, but the language is a little outside my knowledge, so I’ll just thank you for your comment about high standards as we slog through the wastelands! BTW, any chance you found my second edition? Amazon did me no favor when I gave them permission to publish my first edition, as they glutted the market, and no one can even find my beautiful second edition (nicer cover, more art inside, some typos and clunky writing smoothed out). And never paid me a penny for any sales – like many, many other authors who’ve tried to bring legal charges against the behemoth, but can’t. Just curious.